The first law of thermodynamics states that the energy of an isolated system is conserved. Therefore, to change the energy of a system, energy must be transferred to or from the system. Heat and work are the only two mechanisms by which energy can be transferred to or from a control mass. Work performed on a body is, by definition  an energy transfer to the body that is due to a change of the external parameters of the body (such as the volume, magnetization, center of mass position in a gravitational field etc.). Heat is the energy transferred to the body in any other way. This definition of heat applies generally: it does not appeal to any notion of thermal equilibrium. In case of bodies close to thermal equilibrium where notions such as the temperature can be defined, heat transfer can be related to temperature difference between bodies. It is an irreversible process that leads to the bodies coming closer to mutual thermal equilibrium. The unit for the amount of energy transferred by heat in the International System of Units SI is the joule (J), though the British Thermal Unit and the calorie are still used in the United States. The unit for the rate of heat transfer is the watt (W = J/s). Heat Q can flow across the boundary of the system and thus change its internal energy U. Heat transfer is a path function (process quantity), as opposed to a point function (state quantity). Heat flows between systems that are not in thermal equilibrium with each other; it spontaneously flows from the areas of high temperature to areas of low temperature. When two bodies of different temperature come into thermal contact, they will exchange internal energy until their temperatures are equalized; that is, until they reach thermal equilibrium. The adjective hot is used as a relative term to compare the object’s temperature to that of the surroundings (or that of the person using the term). The term heat is used to describe the flow of energy. In the absence of work interactions, the heat that is transferred to an object ends up getting stored in the object in the form of internal energy. Specific heat is defined as the amount of energy that has to be transferred to or from one unit of mass or mole of a substance to change its temperature by one degree. Specific heat is a property, which means that it depends on the substance under consideration and its state as specified by its properties. Fuels, when burned, are converted to molecules with a lower internal energy. The change in energy is heat. Upon changing from one phase to another, a pure substance releases or absorbs heat without its temperature changing. The amount of heat transfer during a phase change is known as latent heat and depends primarily on the substance and its state. It is measured in watts. Heat flux is defined as rate of heat transfer per unit cross-sectional area, and is denoted q, resulting in units of watts per square metre, though slightly different notation conventions can be used. In 1854, German physicist Rudolf Clausius defined the second fundamental theorem (the second law of thermodynamics) in the mechanical theory of heat (thermodynamics): "if two transformations which, without necessitating any other permanent change, can mutually replace one another, be called equivalent, then the generations of the quantity of heat Q from work at the temperature T, has the equivalence-value:"
In other words, the entropy function S facilitates the quantification and measurement of heat flow through a thermodynamic boundary. In a thermodynamic sense, heat is never regarded as being stored within a body. Like work, it exists only as energy in transit from one body to another; in thermodynamic terminology, between a system and its surroundings. When energy in the form of heat is added to a system, it is stored not as heat, but as kinetic and potential energy of the atoms and molecules making up the system. The noun heat is defined only during the process of energy transfer by conduction or radiation. Heat is defined as any spontaneous flow of energy from one object to another, caused by a difference in temperature between the objects. Heat may be defined as energy in transit from a high-temperature object to a lower-temperature object. Heat as an interaction between two closed systems without exchange of work is a pure heat interaction when the two systems, initially isolated and in a stable equilibrium, are placed in contact. The energy exchanged between the two systems is then called heat. Heat is a form of energy possessed by a substance by virtue of the vibrational movement, i.e. kinetic energy, of its molecules or atoms. The kinetic energy and heat may formally be equivalent, but they are not identical. Heat is the transfer of energy between substances of different temperatures. the internal energy associated with the atomic bonds in a molecule. the tremendous amount of energy associated with the strong bonds within the nucleus of the atom itself. the sum of sensible and latent forms of internal energy. This combined quantity ΔU + Wboundary is enthalpy, H, one of the thermodynamic potentials. Both enthalpy, H, and internal energy, U are state functions. State functions return to their initial values upon completion of each cycle in cyclic processes such as that of a heat engine. In contrast, neither Q nor W are properties of a system and need not sum to zero over the steps of a cycle. The infinitesimal expression for heat, δQ, forms an inexact differential for processes involving work. However, for processes involving no change in volume, applied magnetic field, or other external parameters, δQ, forms an exact differential. Likewise, for adiabatic processes (no heat transfer), the expression for work forms an exact differential, but for processes involving transfer of heat it forms an inexact differential. The molar and specific heat capacities are dependent upon the internal degrees of freedom of the system and not on any external properties such as volume and number of molecules. The specific heats of monatomic gases (e.g., helium) are nearly constant with temperature. Diatomic gases such as hydrogen display some temperature dependence, and triatomic gases (e.g., carbon dioxide) still more. In liquids at sufficiently low temperatures, quantum effects become significant. An example is the behavior of bosons such as helium-4. For such substances, the behavior of heat capacity with temperature is discontinuous at the Bose-Einstein condensation point. The quantum behavior of solids is adequately characterized by the Debye model. At temperatures well below the characteristic Debye temperature of a solid lattice, its specific heat will be proportional to the cube of absolute temperature. For low-temperature metals, a second term is needed to account for the behavior of the conduction electrons, an example of Fermi-Dirac statistics. Heat tends to move from a high-temperature region to a low-temperature region. This heat transfer may occur by the mechanisms of conduction and radiation. In engineering, the term convective heat transfer is used to describe the combined effects of conduction and fluid flow and is regarded as a third mechanism of heat transfer. Conduction is the most significant means of heat transfer in a solid. On a microscopic scale, conduction occurs as hot, rapidly moving or vibrating atoms and molecules interact with neighboring atoms and molecules, transferring some of their energy (heat) to these neighboring atoms. In insulators the heat flux is carried almost entirely by phonon vibrations. Fire test used to test the heat transfer through firestops and penetrants used in construction listing and approval use and compliance. The "electron fluid" of a conductive metallic solid conducts nearly all of the heat flux through the solid. Phonon flux is still present, but carries less than 1% of the energy. Electrons also conduct electric current through conductive solids, and the thermal and electrical conductivities of most metals have about the same ratio. 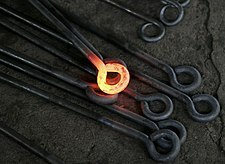 A good electrical conductor, such as copper, usually also conducts heat well. The Peltier-Seebeck effect exhibits the propensity of electrons to conduct heat through an electrically conductive solid. Thermoelectricity is caused by the relationship between electrons, heat fluxes and electrical currents. Convection is usually the dominant form of heat transfer in liquids and gases. This is a term used to characterise the combined effects of conduction and fluid flow. In convection, enthalpy transfer occurs by the movement of hot or cold portions of the fluid together with heat transfer by conduction. Commonly an increase in temperature produces a reduction in density. Hence, when water is heated on a stove, hot water from the bottom of the pan rises, displacing the colder denser liquid which falls. Mixing and conduction result eventually in a nearly homogeneous density and even temperature. Two types of convection are commonly distinguished, free convection, in which gravity and buoyancy forces drive the fluid movement, and forced convection, where a fan, stirrer, or other means is used to move the fluid. Buoyant convection is due to the effects of gravity, and hence does not occur in microgravity environments. Radiation is the only form of heat transfer that can occur in the absence of any form of medium (i.e., through a vacuum). Thermal radiation is a direct result of the movements of atoms and molecules in a material. Since these atoms and molecules are composed of charged particles (protons and electrons), their movements result in the emission of electromagnetic radiation, which carries energy away from the surface. At the same time, the surface is constantly bombarded by radiation from the surroundings, resulting in the transfer of energy to the surface. Since the amount of emitted radiation increases with increasing temperature, a net transfer of energy from higher temperatures to lower temperatures results. The power that a black body emits at various frequencies is described by Planck's law. For any given temperature, there is a frequency fmax at which the power emitted is a maximum. Wien's displacement law, and the fact that the frequency of light is inversely proportional to its wavelength in vacuum, mean that the peak frequency fmax is proportional to the absolute temperature T of the black body. The photosphere of the Sun, at a temperature of approximately 6000 K, emits radiation principally in the visible portion of the spectrum. The Earth's atmosphere is partly transparent to visible light, and the light reaching the Earth's surface is absorbed or reflected. The Earth's surface emits the absorbed radiation, approximating the behavior of a black body at 300 K with spectral peak at fmax. At these lower frequencies, the atmosphere is largely opaque and radiation from the Earth's surface is absorbed or scattered by the atmosphere. Though some radiation escapes into space, it is absorbed and subsequently re-emitted by atmospheric gases. It is this spectral selectivity of the atmosphere that is responsible for the planetary greenhouse effect. The common household lightbulb has a spectrum overlapping the blackbody spectra of the sun and the earth. A portion of the photons emitted by a tungsten light bulb filament at 3000K are in the visible spectrum. However, most of the energy is associated with photons of longer wavelengths; these will not help a person see, but will still transfer heat to the environment, as can be deduced empirically by observing a household incandescent lightbulb. Whenever EM radiation is emitted and then absorbed, heat is transferred. This principle is used in microwave ovens, laser cutting, and RF hair removal. Heat exposure as part of a fire test for firestop products. Heat pipes: Using latent heat and capillary action to move heat, heat pipes can carry many times as much heat as a similar-sized copper rod. Originally invented for use in satellites, they are starting to have applications in personal computers. In cold climates, houses with their heating systems form dissipative systems. In spite of efforts to insulate such houses to reduce heat losses to their exteriors, considerable heat is lost, or dissipated, from them, which can make their interiors uncomfortably cool or cold. For the comfort of its inhabitants, the interior of a house must be maintained out of thermal equilibrium with its external surroundings. In effect, domestic residences are oases of warmth in a sea of cold and the thermal gradient between the inside and outside is often quite steep. This can lead to problems such as condensation and uncomfortable draughts (drafts) which, if left unaddressed, can cause structural damage to the property. This is why modern insulation techniques are required to reduce heat loss. In such a house, a thermostat is a device capable of starting the heating system when the house's interior falls below a set temperature, and of stopping that same system when another (higher) set temperature has been achieved. Thus the thermostat controls the flow of energy into the house, that energy eventually being dissipated to the exterior. ^ Clausius, R. (1865). The Mechanical Theory of Heat] – with its Applications to the Steam Engine and to Physical Properties of Bodies. London: John van Voorst, 1 Paternoster Row. MDCCCLXVII.